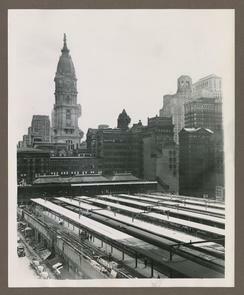 PhilaPlace - Broad Street Station, View of Umbrella Shelters, (Post 1923). Broad Street Station, View of Umbrella Shelters, (Post 1923). Umbrella Shelters were build after the destruction on the trail shed.